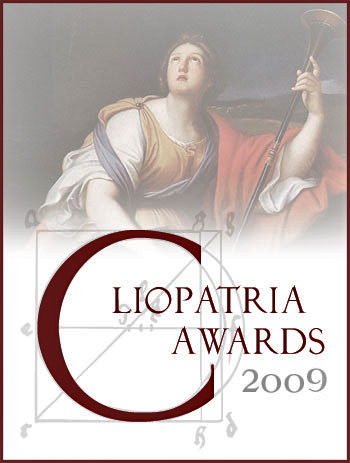 Yesterday night, your humble servant won the 2009 Cliopatria Award for best writing of a history blog. Given its format — the story behind a different historical execution, every day — Executed Today could by rights be monotonous and depressing. It is testament to “The Headsman’s” skills as a writer and storyteller that his blog is nothing of the sort. An engaging and astonishingly prolific blogger, The Headsman writes witty and accessible prose, jumps from continent to continent and century to century with ease, and despite two years of daily blogging he is still finding new things to do with his premise. That’s a pretty close description to this blog’s aspiration. I’m gratified that it sometimes succeeds. One glance at the other winning blogs (Georgian London, Curious Expeditions) and posts (Curating the Oceans: The Future of Singapore’s Past, Richardson’s Rules of Order), or at the other Best Writer nominees, or at any of the previous Clio winners, underscores the quality of the field. Best writer? How do you choose among this bounty? Clio hangs out with Calliope, after all. So, very great thanks to the jury of professional historians for entertaining a mere hobbyist’s contributions. And special gratitude to Tim Abbott of Walking the Berkshires for both the nomination and a good bit of encouragement; to the guest bloggers and interviewees who liven things up around these dolorous parts; and to many others who know who they are, or ought to. Thanks above all to the site’s readers, new and old, regular and sporadic. A few of the more satisfactory posts in the past year are conveniently arranged in Executed Today’s recent annual report: see here for stuff I wrote, and here for guest content that frequently puts it to shame. Well done, i love this blog, and you should be proud, sorry at the belated comment, but only discovered your website about 11 months ago, keep writing so i can keep looking forward to your next post with anticipation. Who says the death penalty can’t be both educational AND fun??? Well done old boy!! Executed Today is my one love in life! Wow…..congrats and wish u more success. Another regular reader here just wanting to say congrats! Congratulations. I am an avid follower of this blog. I also appreciate the fact that this blog features many executions from the Philippines like the execution of Dr. Jose Rizal, our national hero, in 1896 and the electrocution of the rapists of Maggie de la Riva in 1972. “Executed Today” not only chronicles past executions but even attempts to put these executions in their proper historical context. That’s why I always look forward to reading “Executed Today” everyday. Huzzah 3x! I could not be more delighted for you and for the greater History blogging community that your writing serves! Now Jason, keep your head, man! Seriously, that’s one great job. Congrats, Jason! You certainly deserve this, my friend!